Here I are my impressions of Comet Hale-Bopp both subjective and objective, in the hopes of encouraging others to get out to find and view this wonderful interplanetary visitor. Caption: Comet Hale-Bopp on a 5 second exposure 3900mm f/11 (prime focus on a Celestron C-14) on ISO 400 SFW film around 8:30 p.m. EST. The nuclear regions are burnt in even with short exposure. The entire day was clear. My grandson Chris and I went out to the Rogers Observatory to take some photographs of the comet's coma and those wonderful arcs. They were indeed there. Stay tuned to this space and see what I got. The comet is definitely a brilliant sight, even through a car window. It reminds me of Comet Bennett, back in 1970, when I drove from Grand Rapids to the Veen Observatory. As I drove eastward in the early morning it appeared through the windshield to hang like the Sword of Damocles and remember the terror that comets inspired in ancient times. It is sad to think that even today, in these supposedly enlightened times, of those in that California cult who committed suicide in order to reach some imaginary UFO hiding behind the comet. 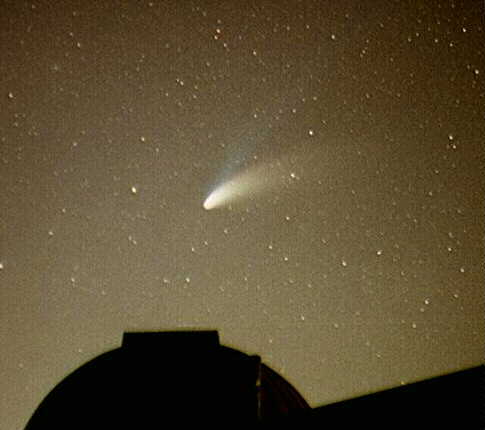 Caption: Comet hale-Bopp setting over the dome of the Rogers Observatory. The sky glow is a combination of twilight and the light pollution from Traverse City. This is a 40 second exposure 50mm f/2 on ISO 400 SFW film. It started to clear late in the day. By 8 p.m. the sky was quite clear for the third and only clear comet watch night at the Rogers Observatory. We had 250 people sign in, for a nice evening until about 9:30 when a cloud covered the comet for the rest of the scheduled observing period. The C14 revealed again two or three sunward arcs. I'm beginning to feel that these are spirals of matter spun out by a rotating nucleus like water from a sprinkler. High clouds visible low in the west as the sun set apparently didn't affect Comet Hale-Bopp as it got dark. The comet shown as brightly as the night before in the northwest. Both ion and dust tails were visible, and about twelve and ten degrees long respectively. Got out the 4.25 inch telescope. Again at about 75 power magnification were the two bright arcs in the coma sunward of the nucleus. Took some photographs. 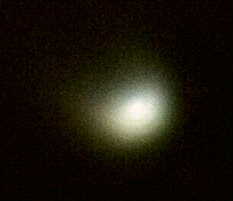 Caption: This is so far my best detailed photo of Comet Hale-Bopp. This is a 3 minute exposure started at 9:10 p.m. EST 200mm f/4 on ISO 400 SFW film. We had a beautiful clear night. The comet shown brightly in the northwest. Both ion and dust tails were visible, and about ten degrees long. Thhe ion tail was the longer of the two. Took some photographs. 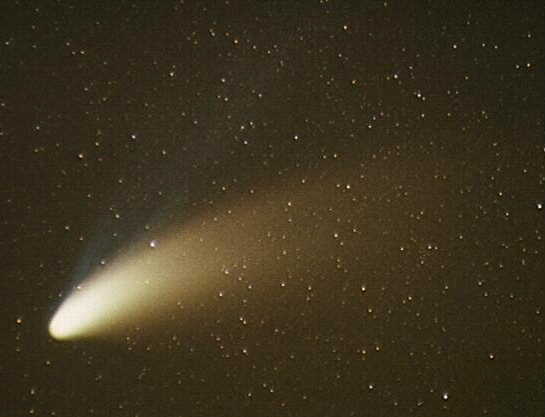 Caption: Comet Hale-Bopp with a lot of foreground light. The red glow to the lower right is my neighbor across the road turning in to their driveway. This is a 80 second exposure started at 8:30 p.m. EST 50mm f/4 on ISO 400 SFW film. The Grand Traverse Astronomical Society held a Lunar Eclipse Watch at Northwestern Michigan College's Rogers Observatory. It was supposed to start at 9:30 p.m. Two of the local TV stations got the times confused with next week's Comet watches, and the observatory hill was mobbed at 8 p.m. I got there at about 8:30 after taping the next two weeks Ephemeris programs, and stopping back home to bundle up against the cold. I ended up at my usual post in the dome with the C14. Most of the folks were interested the comet. I got to sneak out once in a while to check on the progress of the eclipse. It was great! We were clouded out on last years two total lunar eclipses, so it's been a long time since I've seen one. Anyway, the head of the comet contained again the two arcs mentioned in the March 18th entry. The bright nuclear region also appeared to show a sunward jet. By the way, I'm told that we had over 500 people, some with infants in arms, on a very cold night. Caption: Comet Hale-Bopp on a 80 second exposure 75mm f/4 on ISO 400 SFW film starting at 5:20 a.m. EST. The long blue ion tail is much longer than the broader and brighter dust tail. What met my gaze as I went outside at 5:10 a.m. was that there was this bright tail in the northeast that had a bright star at the end of it. The view was absolutely awesome to paraphrase my grandson. To the unaided eye both ion diverging dust tails could be easily traced to 10 degrees. Again I took lots of photos. The dust tail orientation from the head was between 11 and 12 o'clock. The ion tail was about 10 o'clock. 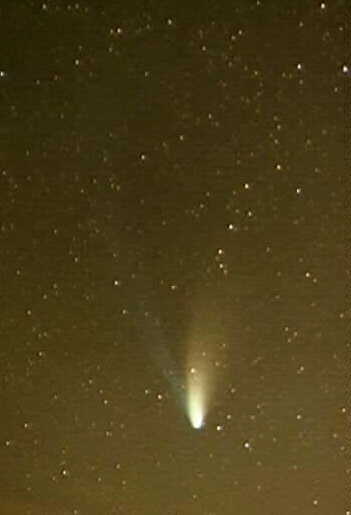 March 18, 1997 Caption: Comet Hale-Bopp above 'Antennae Borealis' in the moon light. This is a 20 second exposure started at 8:10 p.m. EST 28mm f/4 on ISO 400 SFW film. This gives a feel of how the comet looks to the unaided eye. The skies were very clear, and the comet higher than ever in the evening. Though I usually use the Rogers Observatory telescopes, I pulled out my old 4 1/4 inch f/6 reflector for a close look at the comet's head. At 75X definite activity could be seen in the head of the comet. The view was inverted so is the following description. The head of the comet had a near stellar bright core. The wide dust tail trailed out of the eyepiece view between 8 and 9 o'clock. There was a cut out in the inner tail and head between 9 and 6 o'clock, the shadow of the head. The faint ion tail trailed out between 8 and 7 o'clock. In the bright side of the head, facing the sun, there appeared two concentric arcs of light from 12 to 3 o'clock. The inner of the two appeared the brighter. I took lots of exposures including some shorter one in hopes of capturing some of the activity in the comet's head. My first impression of the comet was that it was a star with a tail. It stayed clear the entire night, a rarity this time of year, so when I got up at 5 a.m., the Comet Hale-Bopp was bright in the northeast. It seemed a good deal brighter than Vega. The dust tail was bright and broad extending about 5 to 7 degrees upwards. The ion tail was also visible, but appeared shorter, at about 3 degrees in binoculars. Took more photos at 200 mm and 75 mm focal length. I used f/4 to limit the vignetting seen in my f/2 and f/2.8 photos. We'll see how they come out. 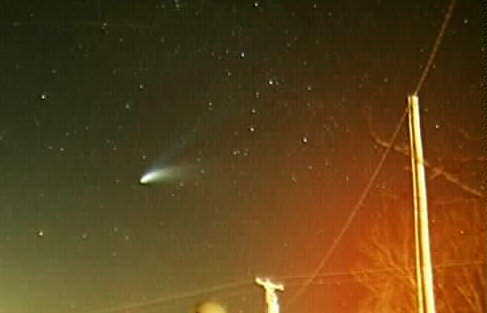 March 11, 1997 Caption: Comet Hale-Bopp setting through 'Antennae Borealis'. This is a 5 minute exposure started at 8:08 p.m. EST 200mm f/4 on ISO 400 SFW film. The ion tail is visible here but not to the eye. The red artifact to the upper left is an internal reflection in the camera of the overexposed antenna light to the lower right. I got home at 7:30 p.m. and immediately got ready to take photos. The sky was very clear. 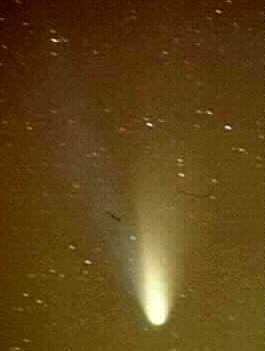 The Comet Hale-Bopp had its bright broad tail horizontally extending to the right. I could not detect the ion tail, expected to the upper right of the comet perhaps it was too low in the sky. The comet began to set again through my local constellation of Antennae Borealis (see March 8). The comet was also too low to make brightness comparisons with bright stars. 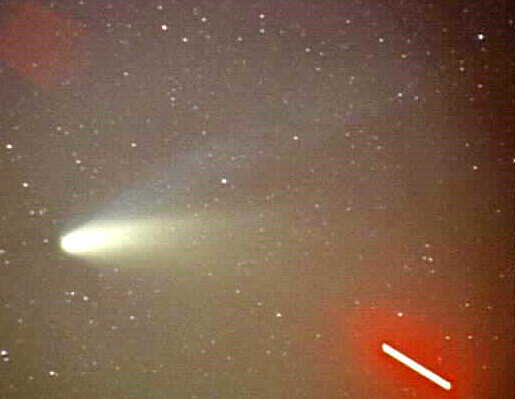 March 10, 1997 Caption: Comet Hale-Bopp on a 90 second exposure 75mm f/4 on ISO 400 SFW film starting at 5:28 a.m. EST. The long ion tail can be followed almost to the top of the image. The dim group of stars mentioned in the text can also be seen along the ion tail. The ion tail was much longer than seen visually. The comet was brilliant as I got up at 5 a.m. After some scattered clouds came through, I set up the mount and took a variety of photos. Head of the comet seemed brighter than Vega now. The tail seemed as long as on the seventh. The ion tail seemed 6-7 degrees long with the dust tail some 5 degrees long. To the unaided eye the ion tail seemed longer than in 7X35 binoculars. This may be due to a group of dim stars visible in binoculars but not really discernible as such to the unaided eye. We were playing cloud tag this morning. I got up at 3:30 a.m. to be able to spot Mars dimly through the overcast. That was all that was visible. I went inside to check the weather satellite images on the Web, and found that we were on the south edge of a cloud bank, and it was likely to get worse. However by 4:30 it has cleared up considerably with the comet easily visible. I got out to the Rogers Observatory in time to have the sky start to cloud up. However for the 20 or so visitors that did show up, the comet was more or less visible to the unaided eye, binoculars and the C14 main telescope. The early a.m. Hale-Bopp watch at the Rogers Observatory was clouded out. On my way over at 4:30 a.m. I listened to a talk show on the radio featuring Alan Hale, co-discoverer of the comet. But did get three visitors, one from 50 miles north in Charlevoix where there were holes in the cloud cover. It cleared up in the morning, and was bright and sunny the rest of the day. Just before sunset some high clouds began to be apparent on the western horizon. Now it was a race between the clouds and the comet. I spotted Hale-Bopp low in the northwest at 7:30 p.m. at the top of the constellation Antennae Borealis. Never heard of it? It's my name for the red lights on the four transmission towers of WTCM-AM half a mile northwest of my residence. To the unaided eye the comet appeared to lie on its side with the dust tail extending horizontally to the right. Between the thin cloud in the area, twilight and the low altitude the comet was not as impressive in brightness as it was in the morning sky. The fainter ion tail was not visible at all. I had some problem setting up the tracking mount. 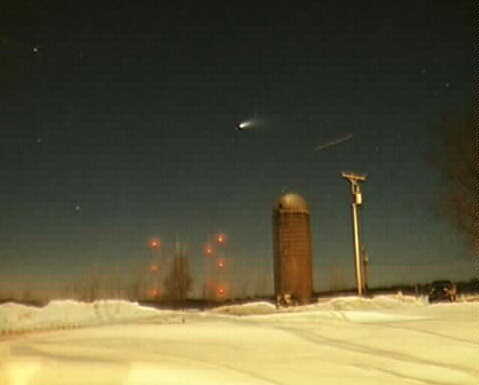 A silo across the street was interfering with the comet's tail when I set up the tripod in the driveway. I ended up setting it up atop a three foot snow draft. The alternating warm and cold weather of the past month made the snow hard enough to support the tripod and me. I got some shots of the comet along with some terrestrial objects. By the way this morning was the 21st anniversary of the glorious morning in 1976 when Comet West was visible in all its glory here, after a similar long period of cloudiness. 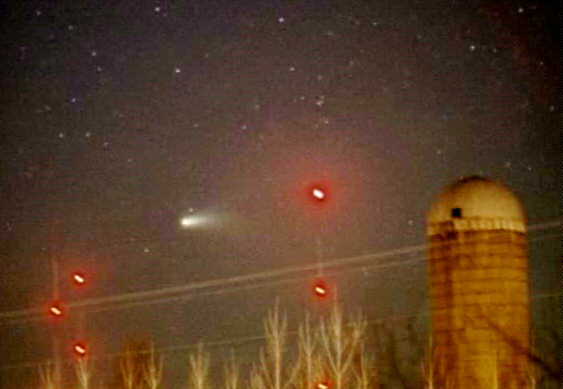 Caption: Comet Hale-Bopp, 'Antennae Borealis' and the silo across the road. This is a 2 minute exposure started at 8:04 p.m. EST 200mm f/4 on ISO 400 SFW film. The ion tail is visible here but not to the eye. The red artifact to the upper left is an internal reflection in the camera of the overexposed antenna light to the lower right. Caption: Comet Hale-Bopp on a 2 minute exposure 200mm f/2.8 on ISO 400 SFW film starting at 4:32 a.m. EST. The long blue ion tail is much longer than the broader and brighter dust tail. It's finally clear. After uploading those words from March 6th, I noticed it was clearing up when I went to bed. Not wanting to miss the comet, I set the alarm for 4 a.m. It stayed clear. I set up the camera mount out in the driveway. The comet was low in the northeast, still in the glow of Traverse City, but the tail, now that the moon was out of the sky, was easily visible and 3 to 5 degrees long. 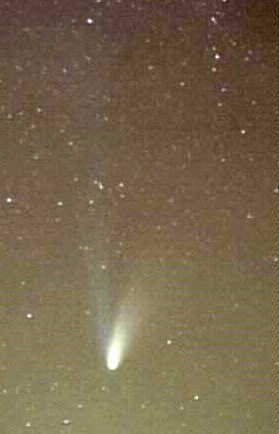 This was the wide dust tail whose width spread from 12 to 1 o'clock from the comet's head. 7X50 and 7X35 binoculars showed also a longer ion tail at about 12 o'clock that seemed about 6 degrees long. Together with the three bright stars of the Summer Triangle, Vega, Deneb and Altair, the inclusion of Hale-Bopp makes it into the "Summer Parachute" which will dissolve shortly, as the comet moves on. My brightness estimate for the comet is about +0.25. It seems a bit dimmer than Vega, and brighter than Altair. Since I seem to be about .25 magnitude dimmer in my estimates than others who know what they're doing in the brightness estimation game, I'm willing to bet that Hale-Bopp has reached magnitude zero. I killed off a roll of ASA 400 on various shots of the comet with 50, 75 and 200 mm lenses between f/2 and f/2.8 and 1 to 4 minute exposures. There may be a picture with this entry in a week. I'm going nuts! It hasn't been clear for almost a week, and we're wasting dark morning skies. I downloaded one scanned image of February 26th from Seattle Film Works and added it to and extended the text for that day. After a nasty day yesterday in which up to a foot of wet snow fell (It seemed like 5 inches at the house), it cleared over night. I got up at 5 a.m. and there was still a lot of high clouds out. By 5:45, most of that was gone. In 7X50 binoculars the comet was bright with a broad tail centered at 1 o'clock from the head. The tail seemed almost 2 degrees long above the light pollution of Traverse City and with a gibbous moon in the south. I've lost track of the ion tail, I thought I saw on the 26th. The head of the comet now appears as bright as Altair to the right at magnitude +0.77. Took more photographs. A windy morning with light clouds scudding across the sky. Temperature was just below freezing. A bright gibbous moon was in the southwest. The comet appeared much as on the 20th, perhaps a bit brighter. A short tail was visible to the unaided eye extending at 1 o'clock from the head, but very faint in the moonlight of 5:30 a.m. The tail was more prominent in 7X35 and 7X50 binoculars, and perhaps two degrees long. A faint tail, presumably an ion tail was barely visible, or imagined at 11 o'clock from the nucleus. This was shorter and thinner than that reported on February 13th. I set up a equatorial tracking mount and took some telephoto shots 200mm f/2.8 for 2, 3, and 4 minutes on ASA 400. The image is from the 2 minute exposure. Up in the picture is towards 11 o'clock. A beautiful clear morning after 6 cloudy ones. The nearly full moon was low in the west, and was out light polluting Traverse City. Temperatures were in the 20's. Comet Hale-Bopp appeared as bright or brighter than Deneb, the brightest star in Cygnus at magnitude 1.25, above left of the comet. I first spotted the comet about 4:45 a.m. Again at first glance it looked stellar, but on further inspection, showed itself to be fuzzy. In binoculars a diffuse tail appeared to extend about 1 o'clock from the nucleus and over one degree long. At 5:45 with the comet higher and the moon lower, the tail could be glimpsed with the unaided eye. Finally a clear morning! 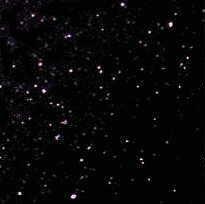 At first Comet Hale-Bopp appeared starlike on a line between the first magnitude stars Deneb and Altair. The comet appeared to be a bit brighter than Gamma Cygni (Sadr) the star at the junction of the wings and body of Cygnus the Swan or the upright and crosspiece of the Northern Cross. Sadr is magnitude 2.2, so if Hale-Bopp is about 2.0, it's on target to be first magnitude in late March. A closer look at the comet with the unaided eye showed that it was fuzzy rather than starlike. In binoculars a bright fan shaped glow appeared to extend to the upper left of the coma or head. 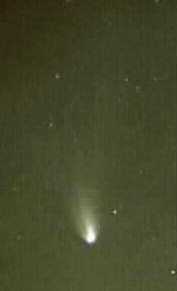 There also appeared to be a 2 to 3 degree long, thin, and faint tail pointed directly above the comet. I wasn't really sure of the tail until I checked the orientation with the Looking Up program. The observations were made with 7X35 and 7X50 binoculars over a period from 5:30 to 6:10 a.m., first from my house 6 miles southwest of Traverse City and hampered by its sky glow. I then drove 7 miles south to out flank the city lights. Temperature was about -11 degrees F. This was the first really clear morning in several weeks. We generally expect more clear skies as Lake Michigan cools and shuts down the lake effect clouds and snow.